For many years, celluloid has been the choice of guitarists worldwide. Most have used them in a dark tortoise shell color with a popular guitar manufacturer’s logo on it. 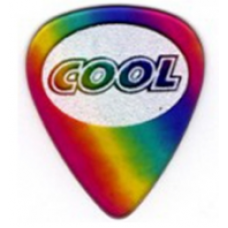 Our RAINBOW SAND picks are made of 100% celluloid in a Rainbow coloring. We at cool music know that no two guitarists are alike and that is why the revolutionary Rainbow Sand pick was created. If you are now playing another celluloid pick, you owe it to yourself to… “TRY THIS PICK”!! !